*Terms and conditions apply. Discounts are only available on participating products and may not include every available supplier; for a full list of details please see partners.aph.com/fdis/terms-and-conditions. Savings shown are based on the full price as found on aph.com. Customers booking online will have their discount automatically applied. APH reserve the right to change and amend this offer without notice if necessary. APH has been voted the British Travel Awards Best Airport Parking Company, for 9 consecutive years. With 98% customer satisfaction and 37 years experience, it’s easy to see why. Pre-book your airport parking now, and save on the daily prices. 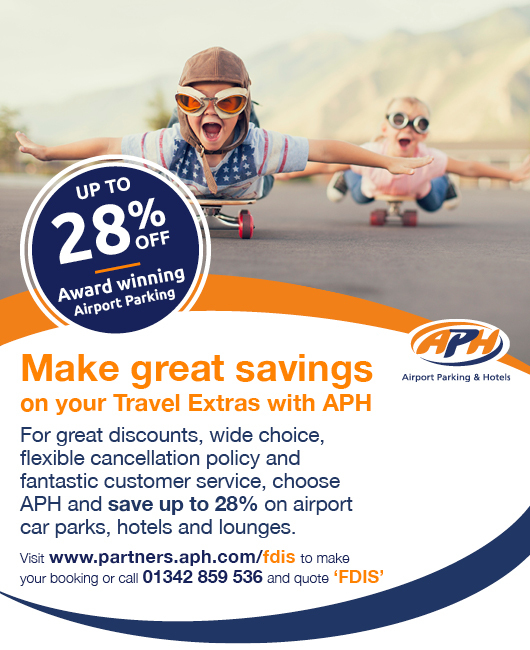 15% discount off APH car parks; including Manchester, Birmingham, Stansted, Luton, Edinburgh and Gatwick at any other time. 10% discount on other car parks and airports across the UK. To make your booking, just call: 01342 859536 and quote ‘FDIS’ to receive your discount.